Metalheads, a glorious reign is coming to an end. The omnipotent Slayer are finally disbanding after almost 40 years touring together, 12 live albums, over 3000 live performances and shaking the world to the core with the formation of a genre of music that would impact generations to come. The Hollywood Casino Amphitheatre is proud to host what will be one of their last-ever concerts, with support from top metal bands Lamb of God, Anthrax, Behemoth and Testament, live on Friday 25th May 2018. 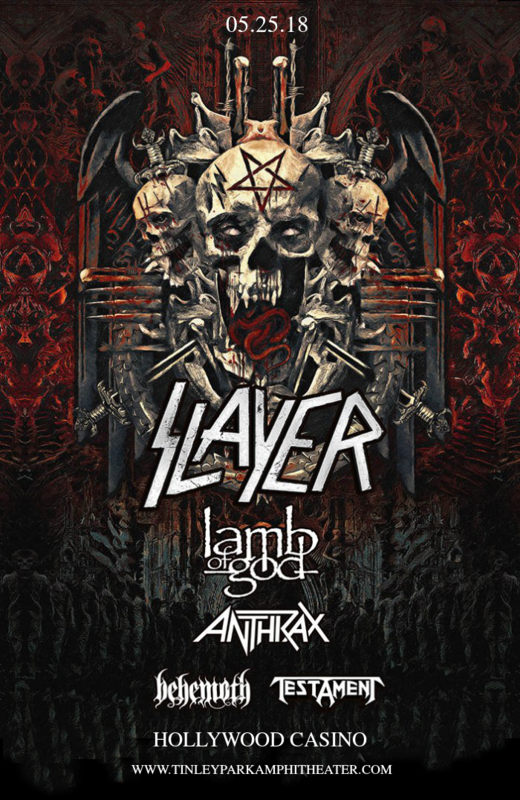 Be part of musical history – get your tickets to Slayer’s farewell tour now, while they last!! Get ready to celebrate four decades of thrash and the legacy of one of the greatest metal bands to ever walk the earth – get your Slayer tickets quick, before they sell out! !